Today Teena and I went on a bus tour of three different breweries through a MeetUp group called Toronto Beer Lovers. There were 35 of us beer enthusiasts aboard who headed out to Guelph and Oakville for the afternoon. 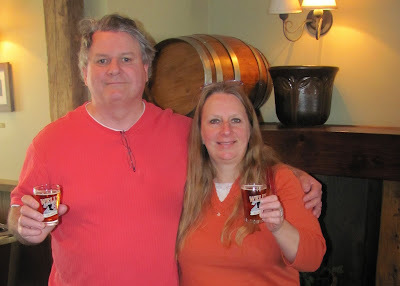 The first brewery we visited was Wellington Brewery in Guelph. It was a pretty large operation, with a large pub style beer sampling room. All the beers they brew were available for sampling and afterwards, assistant brewmaster Ryan led us on a tour of the brew house. They have been operating for 26 years. My favorite beer there was the Wellington Imperial Russian Stout. Of course I came home with a six pack of that. A one-off cask ale. This was very different as it had Chamomile and Changa mushrooms. Next stop was F&M Brewery which was right around the corner. They are best known for their Stonehammer Pilsner. It was my favorite of the beers I tried there and came home with a six pack. George is the brew master and took us on the tour. He was very animated and very very passionate and proud of what he does. Making beer can be messy. When the yeast is working in a vessel, it creates overflow. Then it was off to Trafalgar Brewing Company in Oakville. They have been brewing for ten years, and also run the operation up in Black Creek Pioneer Village which has a brewhouse that brews beer the same way they did in the 1930s. I came home with a couple of the Black Creek Pale Ale which were brewed there and not up at Pioneer Village. Dave (the one in the beard) is one of the brewmasters and did a great job explaining the operation to us. He also sat out tallboys of their beers and also gave us a sampling of their Maple Bock which is a seasonal beer. He is a chemical engineer. His partner and fellow brewer is a nuclear nuclear physicist, who helped design the Candu reacter and has supervised for NATO the Russian decommission of a part of their nuclear arsenal. Not your everyday brewers! We were allowed to wander and look around. With a Paddy’s Irish Red Lager in hand, I immediately went up to look at the brew tanks. I wanted to ask what this was for but never got the chance. Looked cool though. It was a great afternoon. We left at just after 11 and were back at 6. The people on the trip were great to get along with. The trip was well organized and I had a terrific time. I would do another tour like this with the group in a heartbeat and look forward to other Toronto Beer Lovers events.